These are cool! Right now these Star Wars Humidifiers are only $34.99 (Reg. $99.99)! Add moisture to the air with the Star Wars R2D2 Humidifier. This fun character humidifier may help soothe coughs and sinus congestion. It features anti-microbial technology to help fight mold and mildew. 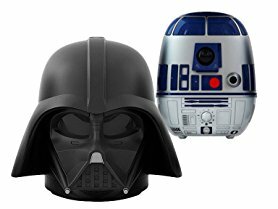 Star Wars-Darth Vader 2 Liter capacity ultrasonic cool mist humidifier adds moisture to any room! it fights mold and mildew and features anti-microbial technology, on/off dial (min/max settings) and a mist nozzle.